4th February 2019, New Delhi: The angel tax issue that has put many startups in a fix over the past few months, has become the most critical issue to the success of startups in India. To better understand the magnitude of the issue, LocalCircles, India’s largest community social media platform and the Indian Private Equity & Venture Capital Association (IVCA), launched a survey among startups. The survey consisted of 3 polls and a demographics poll which were conducted in the 35,000+ strong Doing Business and Startup ecosystem on LocalCircles. The survey received more than 10,000 responses from approximately 2500 unique startups/entrepreneurs across the country, which is remarkable in just under three days, and this shows the pain among entrepreneurs and angel investors. The whole ecosystem has stood together in ensuring that the numbers support all the earlier recommendations in this matter. 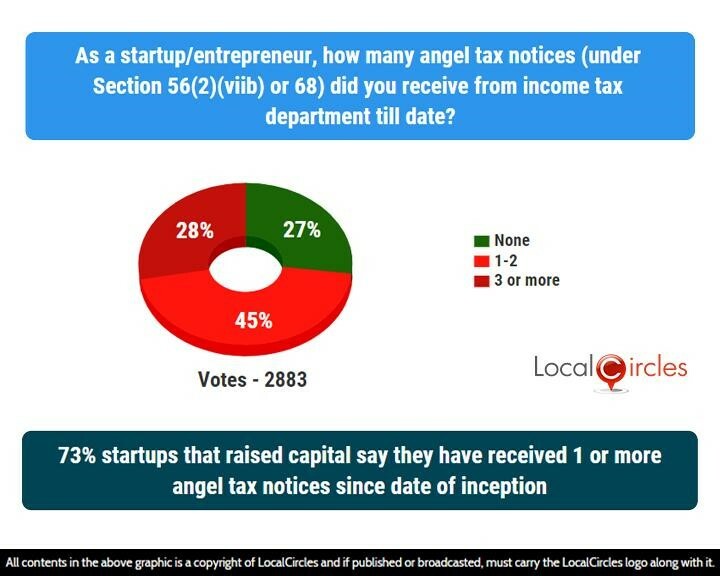 The first question asked as a startup/entrepreneur, how many angel tax notices (under section 56(2)(viib) or 68, did they receive from the income tax department till date. 45% said 1-2 and 28% said 3 or more. 27% said they did not receive any notice. The issue came to light after various startup entrepreneurs reported receiving tax notices on angel investment raised even as many as 3 to 4 years back. The next question asked as a startup that received a tax notice(s), under which section did they receive the notice. 70% said they got it under section 56(2)(viib) while 6% got it under section 68. 24% got it under both sections. The third question asked as a recipient if angel tax notice(s), what was the total amount of fundraising being questioned. 6% respondents said it was less than 50 lakhs, 73% said it was between 50 lakhs and 2 crores, 17% said it was between 2 crores and 10 crores, while 4% said it was over 10 crores. The final question asked startups when they were incorporated. 46% said they were incorporated 2011 or before, 7% said between 2012-2015 and 47% said 2016 or after. 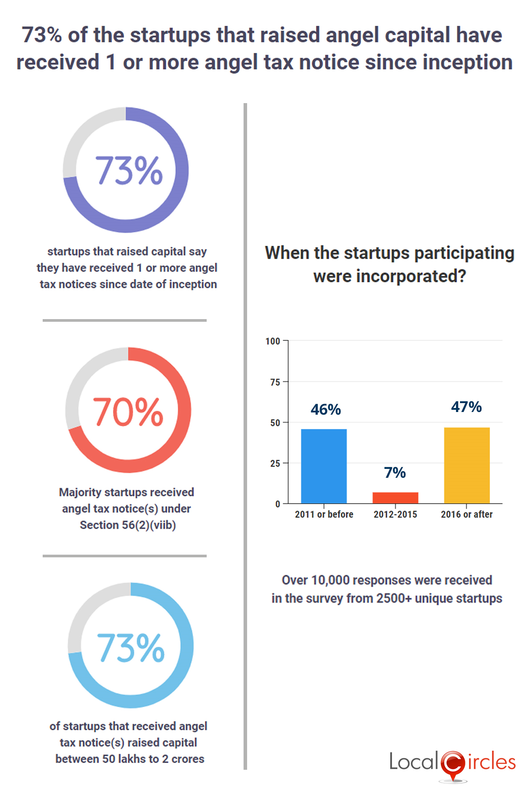 The result of this survey clearly strengthens the case made by startups against angel tax. 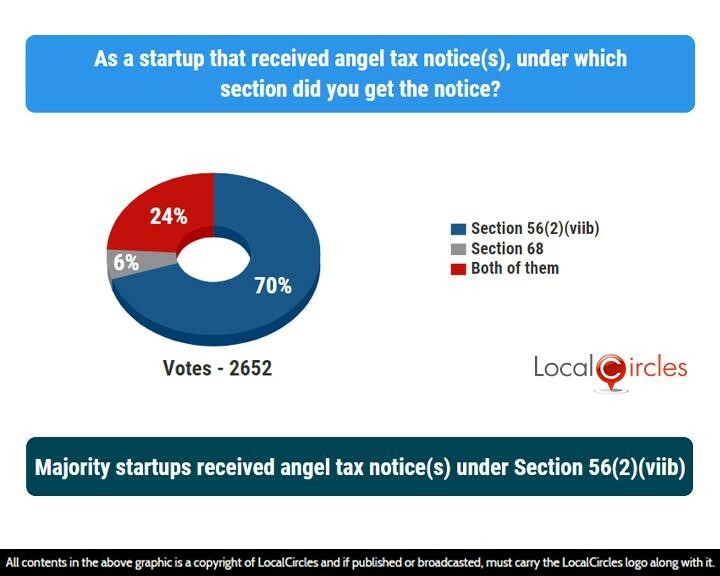 It indicates that most of the Indian startups who are raising money have a high likelihood of receiving an angel tax notice under Section 56 (2)(viib) or under Section 68 or both. Based on inputs given by startups in various community discussions, it appears that the Income Tax systems currently do not have a way of identifying a startup and there is an urgent need to do so. 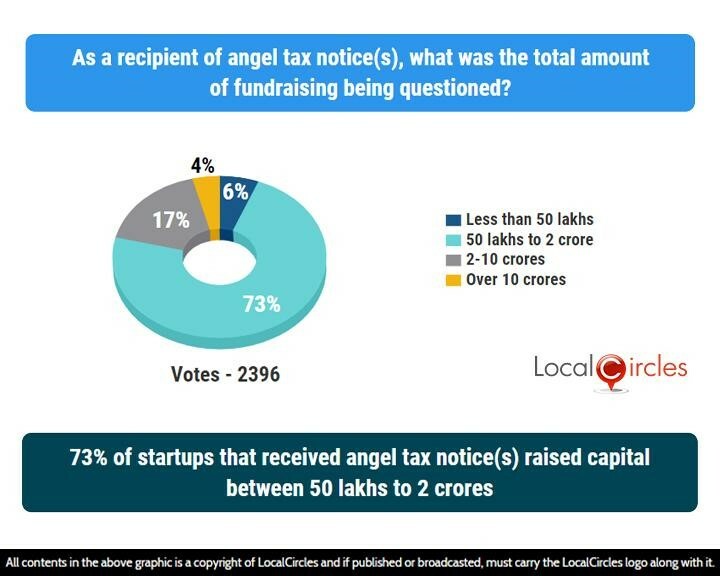 “Like we said that let data do the talking, this brings more clarity to the issue of angel taxation, we have seen active participation from angel networks, VCs, who had reached out to all of their portfolio startups and thus seemingly this survey gives a more credible data,” said Rajat Tandon, President, IVCA. 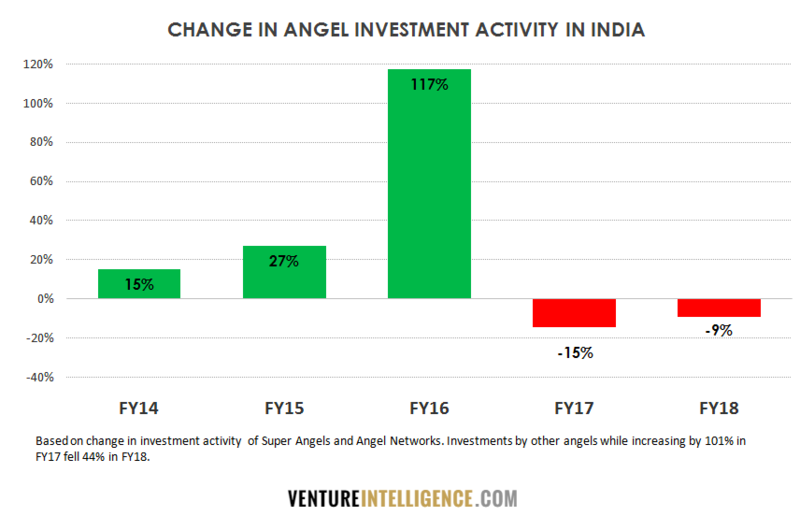 Also, the year on year change in angel investment activity in India points to a trend that angel investors are very cautious in making investments due to these on ground hurdles, especially the infamous Angel Tax, even though the Startup movement is on a rise and number of angel investors have increased, funding has seen a downward trend. Startups were hopeful that the budget will get them some respite from the issue or at least a commitment from Government to resolving the issue, but it stayed unaddressed in FM’s budget speech. A few days back, LocalCircles Founder & Chairman Sachin Taparia had written to the Finance and Commerce Ministers about the urgent need to exempt DIPP level 1 recognised startups to be exempt from angel tax. “The angel tax should be scrapped for Government recognised startups” said Sachin Taparia, “And to do the same startups are also willing to submit a set of 4-5 documents which can easily help DIPP and CBDT differentiate them from shell companies but this devil of angel tax for startups must go away”, continued Taparia. Other suggestions from startups in the discussion on LocalCircles have included the need for the complete scrapping of angel tax for investments up to 25 crores and extending the startup qualification from the existing 7 years to 10 years. The IVCA and other industry bodies including TiE, Nasscom, have all gotten together in past to get these issues resolved. LocalCircles along with iSpirt has made various representation to the Ministry of Commerce and DIPP to put forward the issue of angel tax and possible solutions. Startups faced by angel tax notices are required to pay 30.9% of the investment raised as the tax amount and a similar amount as a penalty as the notices recently being processed are for 2015-16 and 2016-17. The Indian Private Equity & Venture Capital Association (IVCA) is the apex body representing the Alternative Investment Funds (AIFs) in India and promotes stable, long-term capital flow (Private Equity (PE), Venture Capital (VC) and Angel Capital) in India. 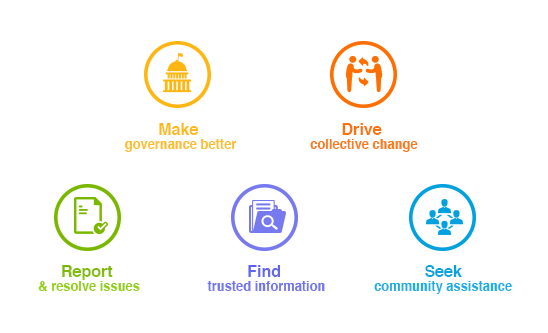 With a prime motive to support the ecosystem, IVCA facilitates contact with policy makers, research institutions, universities, trade associations and other relevant organizations. Thus, support entrepreneurial activity, innovation and job creation. IVCA has nearly 150 Private Equity, Venture Capital, Pension & Sovereign funds as our members, who are leading & highly respected funds.